Members of the Brookhaven Lab research team—(clockwise from left) Stuart Wilkins, Xiaoqian Chen, Mark Dean, Vivek Thampy, and Andi Barbour—at the National Synchrotron Light Source II’s Coherent Soft X-ray Scattering beamline, where they studied the electronic order of “charge stripes” in a copper-oxide superconductor. No image credit. Cuprates, or compounds made of copper and oxygen, can conduct electricity without resistance by being “doped” with other chemical elements and cooled to temperatures below minus 210 degrees Fahrenheit. Despite extensive research on this phenomenon—called high-temperature superconductivity—scientists still aren’t sure how it works. Previous experiments have established that ordered arrangements of electrical charges known as “charge stripes” coexist with superconductivity in many forms of cuprates. However, the exact nature of these stripes—specifically, whether they fluctuate over time—and their relationship to superconductivity—whether they work together with or against the electrons that pair up and flow without energy loss—have remained a mystery. 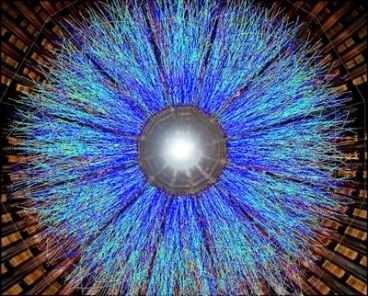 Now, scientists at the U.S. Department of Energy’s (DOE) Brookhaven National Laboratory have demonstrated that static, as opposed to fluctuating, charge stripes coexist with superconductivity in a cuprate when lanthanum and barium are added in certain amounts. Their research, described in a paper published on October 11 in Physical Review Letters, suggests that this static ordering of electrical charges may cooperate rather than compete with superconductivity. If this is the case, then the electrons that periodically bunch together to form the static charge stripes may be separated in space from the free-moving electron pairs required for superconductivity. To see whether the charge stripes were static or fluctuating in their compound, the scientists used a technique called x-ray photon correlation spectroscopy. In this technique, a beam of coherent x-rays is fired at a sample, causing the x-ray photons, or light particles, to scatter off the sample’s electrons. These photons fall onto a specialized, high-speed x-ray camera, where they generate electrical signals that are converted to a digital image of the scattering pattern. Based on how the light interacts with the electrons in the sample, the pattern contains grainy dark and bright spots called speckles. By studying this “speckle pattern” over time, scientists can tell if and how the charge stripes change. In this study, the source of the x-rays was the Coherent Soft X-ray Scattering (CSX-1) beamline at the National Synchrotron Light Source II (NSLS-II), a DOE Office of Science User Facility at Brookhaven. The team’s speckle pattern was consistent throughout a nearly three-hour measurement period, suggesting that the compound has a highly static charge stripe order. Previous studies had only been able to confirm this static order up to a timescale of microseconds, so scientists were unsure if any fluctuations would emerge beyond that point. X-ray photon correlation spectroscopy is one of the few techniques that scientists can use to test for these fluctuations on very long timescales. The team of Brookhaven scientists—representing a close collaboration between one of Brookhaven’s core departments and one of its user facilities—is the first to apply the technique to study the charge ordering in this particular cuprate. “Combining our expertise in high-temperature superconductivity and x-ray scattering with the capabilities at NSLS-II is a great way to approach these kind of studies,” said Wilkins. “The x-ray beam at CSX-1 is stable within a very small fraction of the 10-micron beam size over our almost three-hour practical limit,” added Xiaoqian Chen, co-first author and a postdoc in the X-Ray Scattering Group at Brookhaven. CSX-1’s performance exceeds that of any other soft x-ray beamline currently operational in the United States. In part of the experiment, the scientists heated up the compound to test whether thermal energy might cause the charge stripes to fluctuate. They observed no fluctuations, even up to the temperature at which the compound is known to stop behaving as a superconductor. In a final check, the team theoretically calculated the speckle patterns, which were consistent with their experimental data. Going forward, the team plans to use this technique to probe the nature of charges in cuprates with different chemical compositions. X-ray scattering measurements were supported by the Center for Emergent Superconductivity, an Energy Frontier Research Center funded by DOE’s Office of Science.